9-5, M-F Call for an appointment. 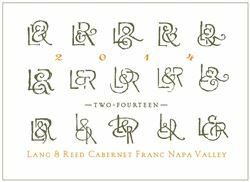 Founded by Tracey & John Skupny over 20 years ago to explore the distinct charms of Cabernet Franc in the Napa Valley and California. Since then we have begun to produce small lots of Chenin Blanc with a similar goal, to produce wines that are varietal expressive and enjoyable to drink. Even though we are a small winery we enjoy great distribution throughout the United States and various other countries. Most often found on well chosen wine lists or fine wine retail shops.